A LONG, wild chasing day! 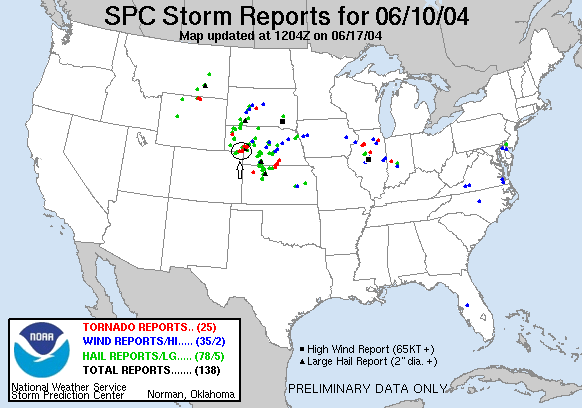 We spent a lot of the early part of the day at the truck stop in North Platte amongst a bunch of other chasers. Eventually we decided to go after a cell south of Chappell, Nebraska. We saw a big, long lived stovepipe tornado (30+ minutes on my tape) that was luckily just north of the town. The tornado was fantastic: It initially formed on the outer edge of the mesocyclone just south of Chappell as a needle funnel with a persistent debris cloud and started rotating counterclockwise along the outside edge. After about 5 minutes the debris cloud disappeared but the funnel persisted and as it rotated to the northeast section of the mesocyclone it touched down again. As the tornado rotated around the back side of the meso (relative to our position east of Chappell) it appeared to move right to left in the opposite direction of the storm motion, and then disappeared behind the wall cloud. The wall cloud then became caught up in the tornadic rotation and produced a very large stovepipe tornado at its base. The video is awesome with the whole storm base rotating violently and a large tail cloud being pulled in and wrapped into the wall cloud. 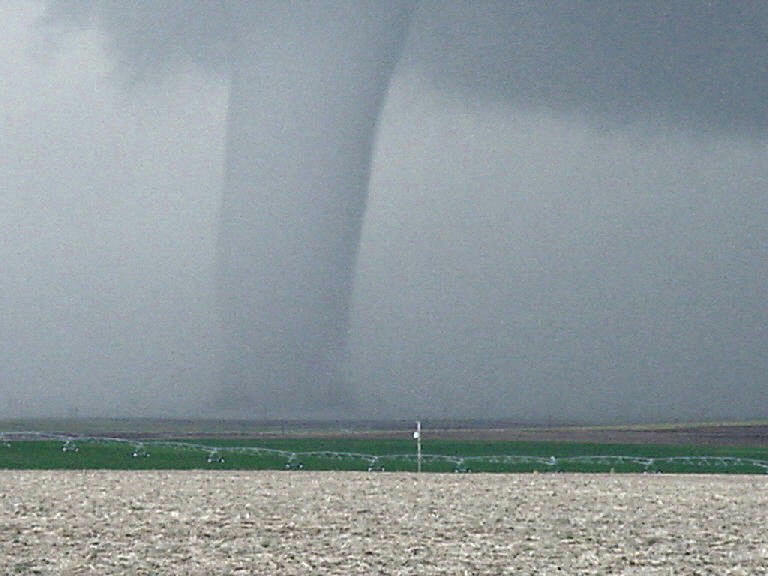 It was on the ground in this form for another 10 minutes before becoming a stout cone tornado and then entered the rope-out phase. After the rope phase of the tornado got rained wrapped we proceeded after the still large, rotating block shaped wall cloud. 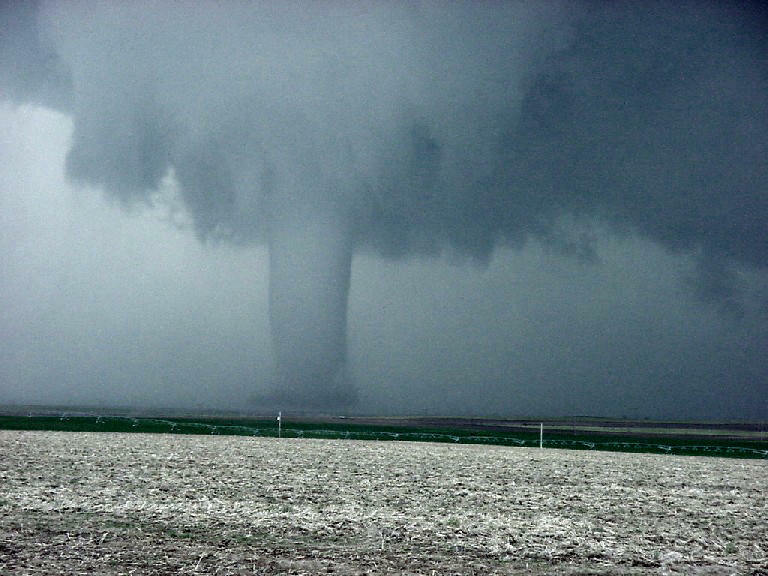 Click here to see the video of this tornado, plus at the beginning a brief view of the previous day's tornado at Woodrow, CO.
After that the chase day got wilder and wilder. We followed the storm, which became an HP beast, northeast only to find that our escape route from the rapidly advancing monster hail core turned into the worst of dirt roads! It was a crazy drive through mud, puddles and off road at times (literally) as we got nailed by 50-60 mph winds, golf ball hail, and torrential rain. Bad enough that we had to do it for a few minutes, but how about for 17 miles!!? Delorme gets a nasty-gram for marking that road paved! To see the video of our harrying escape, click here! Video taken by SLT guest Greg Mazur, the only video / photography on this site I didn't take myself! I'm driving the gold van in front of the one the video is being taken from. Once we finally got clear we saw a monster supercell to the Southeast with a persistent overshooting top. We drove back to North Platte and then on to Gothenburg where the storm generated a large block wall cloud with some amazing rotation and differential motion but did not produce a tornado. Considering the amount of rotation I was really surprised but the RFD never wrapped up and the rotation remained disorganized. We then proceeded to a nice LP storm South of Cozad which had excellent structure and great lightning, and as we were getting ready to leave tour 4 reconnected with us. Ultimately, we spent the night in Lexington, Nebraska. Even at the hotel it didn't end as there were at least two downpours of pea sized hail and there was terrific lightning to the north and to the west as it got close to midnight. What a chase day! This might have been my favorite chase day of all time. Intense! Developing tornado on the ground circles the edge of the mesocyclone. Apparently no longer on the ground, the funnel continues its trek. Needle funnel, enhanced to bring out detail. Again, needle funnel, enhanced to bring out detail. Now moving southwesterly on the back side of the mesocyclone, the tornado is back on the ground. The large wall cloud gets wrapped into the storm rotation. Stovepipe tornado develops under the wall cloud. 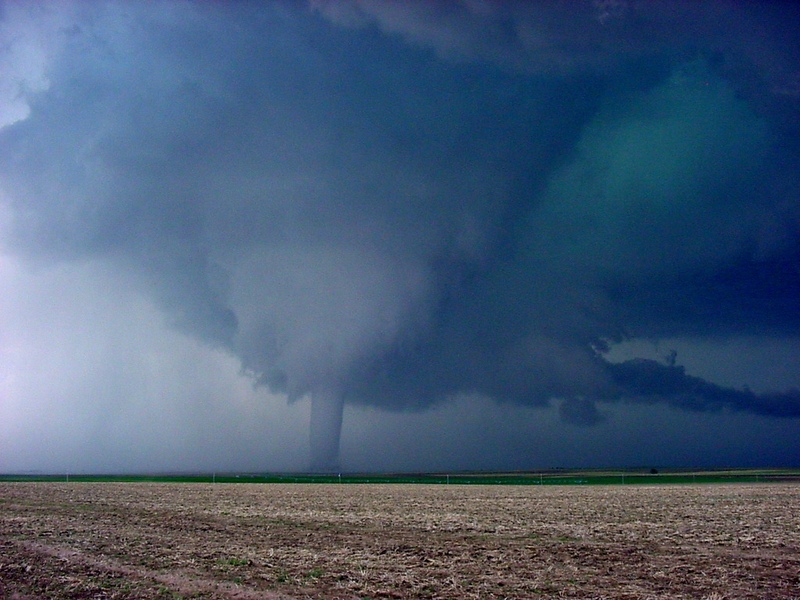 Stovepipe on the ground, enhanced to bring out the tornado detail. Condensation "wings" form around the funnel. Check out the structure of this storm! Same shot as previous, enhanced to bring out the detail. Close up of the tornado, still several miles away. 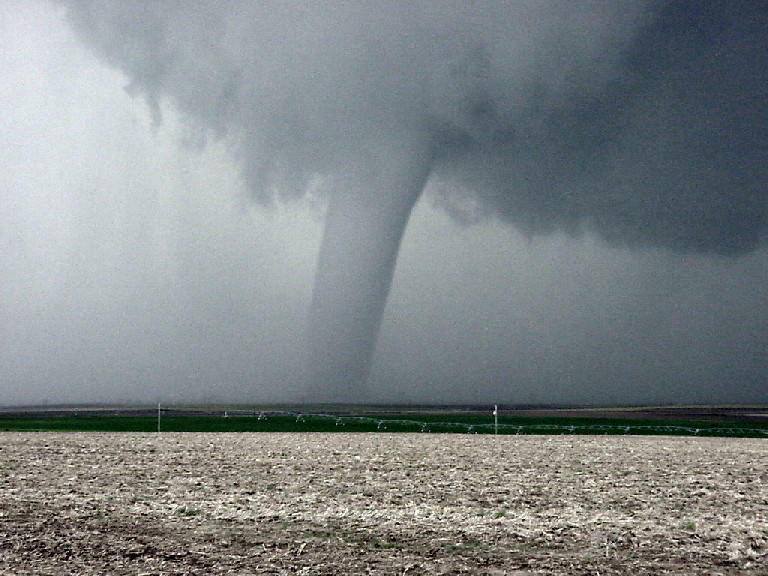 This was a BIG tornado. Same shot as previous, enhanced to bring out the detail. A good look at the structure of the tornado in its mature stage. Beefy wall cloud and tornado, large inflow band being pulled into the storm, and greenish hail glow in the vault region. Stovepipe begins to get wrapped in rain. Same shot as previous, enhanced to bring out the detail. Another storm near Gothenburg, NE. This storm had great rotation but it never produced a tornado. Shelf cloud near Gothenburg. Another storm near Covad with wall cloud and a highly electrified core. Lightning in the storm's core near sunset.